Can objects recognize who is touching them? Could they tell which member of a family is using them? 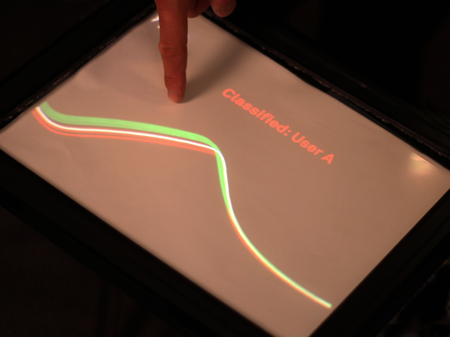 Capacitive Fingerprinting explores how the electrical properties of the human body can be used to differentiate users when they touch screens or other touch-sensitive devices. It enables development of highly personalized interfaces for collaborative applications such as multi-user gaming or location-based entertainment where objects can modify their output according to user. Capacitive Fingerprinting uses Touché sensing technology to measure the impedance of a user across a broad range of signal frequencies. People have different bone densities and muscle mass, wear different clothing and footwear. These personal differences yield unique impedance profiles that enable the correlation of touch events with a particular user. Importantly, this technique does not require any user instrumentation. The Capacitive Fingerprinting was developed at Disney Research by Ivan Poupyrev, Chris Harrison, Munehiko Sato. This project is part of the investigation of sensing applications based on Swept Frequency Capacitive Sensing approach (see Touché).